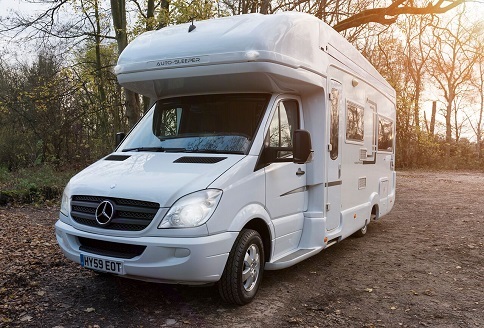 Get £2,000 off this Motorhome in our August Sale! Extra £500 off! Here we have a Used Auto-Sleeper Hampshire 2009 two berth coach built motor home. This model was registered in September 2009 and has done just 18,750 miles. 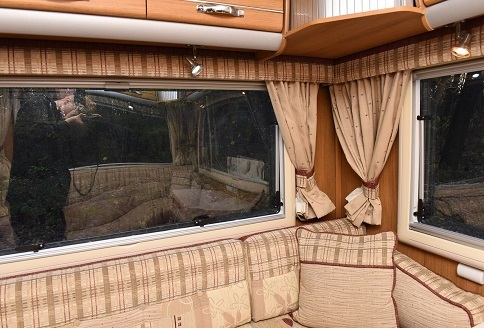 The layout features a large rear lounge converting into two single beds. 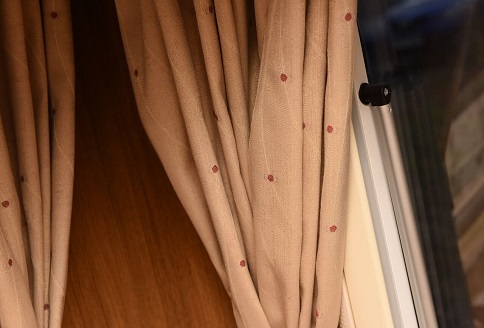 It also features a good, large over-cab storage locker and has lovely beige fabrics. 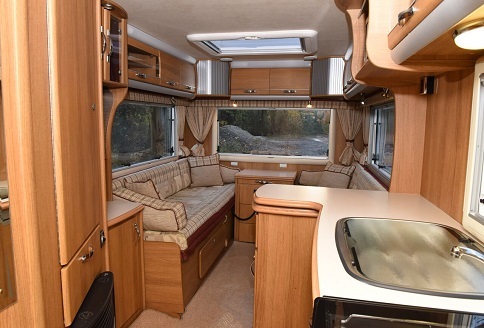 As with all Auto-Sleepers, the Hampshire has an impressive standard specification that includes cab air conditioning and cruise control as well as alloy wheels. The Mercedes engine is a powerful 2.2 turbo diesel. It has a 6-speed gearbox and the Hampshire is rear wheel drive. The Hampshire cab specification features electric windows and door mirrors, a colour reversing camera and an adjustable steering column. Removable carpets are throughout, including the cab and there’s also central door locking and a standard engine immobiliser. 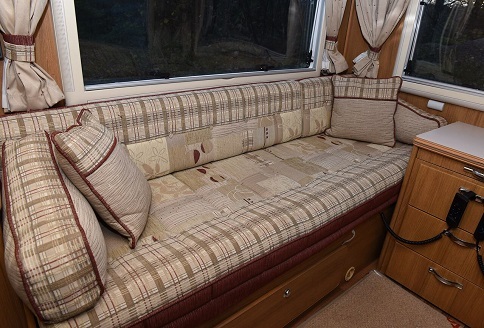 The Hampshire is a large, comfortable two-berth, end lounge motor home with lots of good storage. 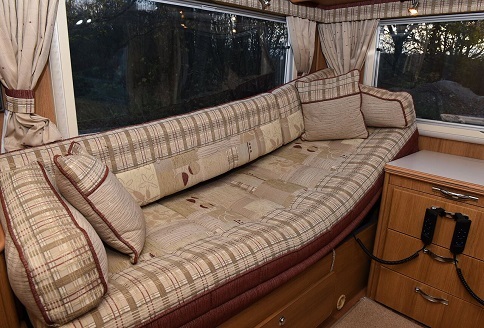 Our used Auto-Sleepers Hampshire 2009 is a very impressive motorhome. 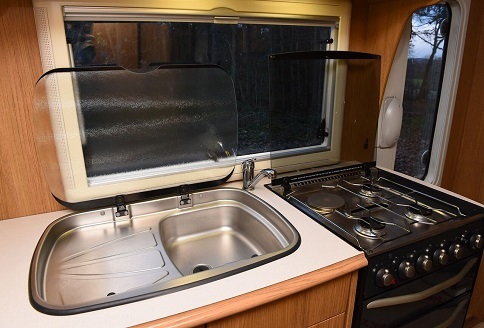 The kitchen features a full-size cooker with separate oven and grill. 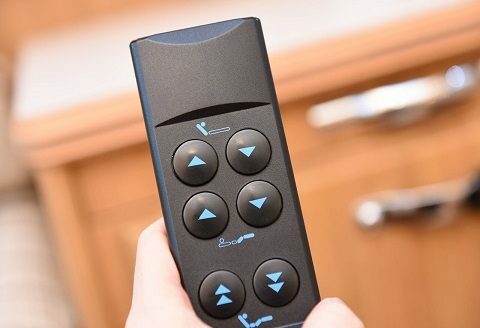 There is also a microwave oven and a three-way fridge that incorporates a freezer compartment too. Also, there is ample locker storage, all found in lockers and a huge overcab locker. Thus, you will never be short on storage. The Lounge is very light and bright and there is a good-size shower room and toilet too. The shower room comprises of an electric flush cassette toilet and a swing-wall sink and shower. Thus, the shower is fully private and separate, keeping the rest of the room dry when used. A very useful feature is the swing-out sink unit as it has storage on the reverse for toiletries. Warm air heating is blown air. Finally, the lounge is very large and features two long sofas that also convert into two single, comfortable electric beds. 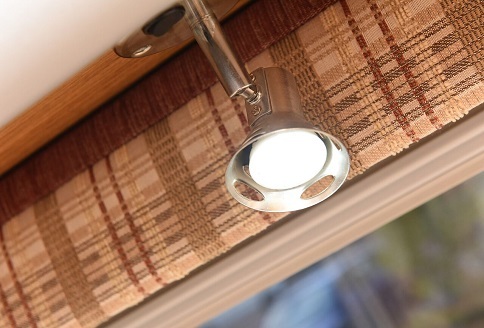 The Hampshire has a built-in awning and free-standing table for use inside or out. There is useful cabinet between the sofas that also extends in to a table top. The large sofas are very comfortable and as beds are electrically adjustable for comfort. With good storage comes useful over-head lockers too. Thus, there is ample storage for the longest of journeys. The lounge also features large windows all around and a “Heki” roof-light overhead. 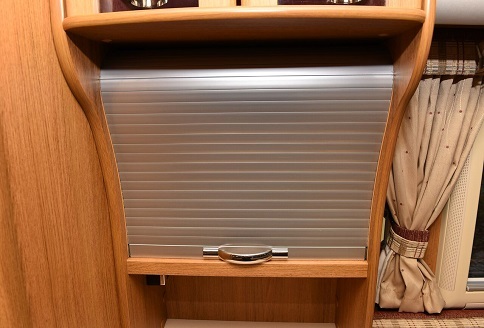 There is a pre-wire TV cupboard with roller door and plug in point. 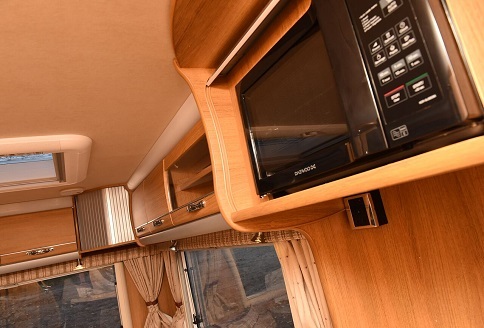 The outside it is just as impressive with alloy wheels, TV aerial, electric step and built-in awning. Finally, the Hampshire has colour a coded front bumper and reversing camera. Part exchange a pleasure.